Harvard head coach Tim Murphy called playing at Fenway Park “special experience” and it was even more special with a win. 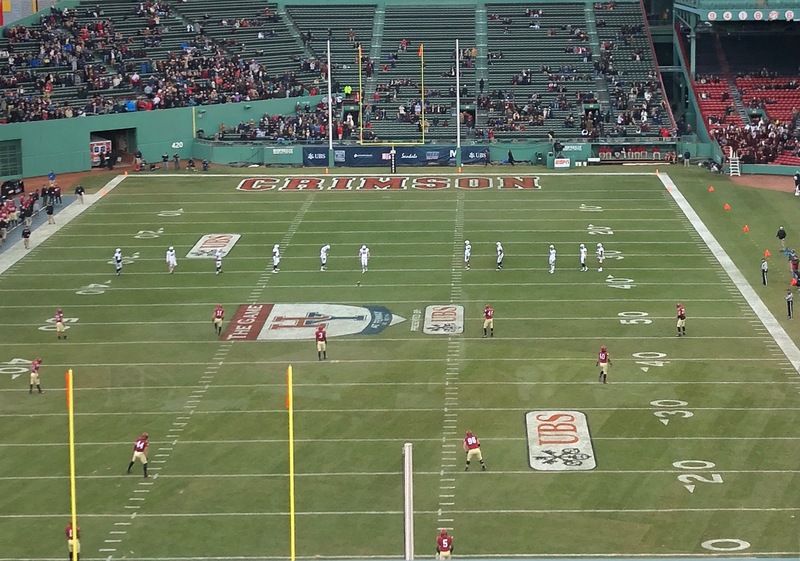 Harvard beat Yale in the 135th playing of “The Game” 45-27. It was the first time the historic rivalry was played at a neutral site since 1894. The matchup marked the 50th anniversary of the 1968 contest which ended in a 29-29 tie in which Harvard scored 16 points in the final 42 seconds. This year’s game was all about offense. The 72 points were the most combined points in the series history. 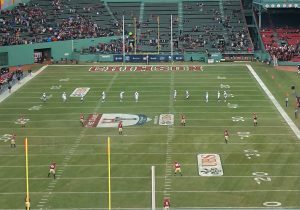 Harvard gained 578 yards of total offense– a record against Yale. Tom Stewart, who was a major question mark coming into the game, was brilliant and went 18-27 for 312 yards with three touchdowns. Things turned somber for Stewart who was carted off the field with what appeared to be a leg injury in the fourth with the game already in hand. The Crimson also put in three touchdowns on the ground to go along with 266 rushing yards. Yale played well as they headed into the fourth quarter down 28-24. Quarterback Griffin O’Connor challenged the Crimson secondary throwing 328 yards and a touchdown. O’Connor threw two picks to Harvard senior captain Zach Miller. Miller said it was an incredible way to go out. JP Shohfi was a standout for Yale, catching 7 passes for 127 yards. Harvard finished this season at 6-4. Head coach Tim Murphy said in his postgame press conference that he “has never been prouder of a team than this team right now.” Harvard stopped Yale’s two-game winning streak in “The Game” and improved to 18-7 under Murphy.